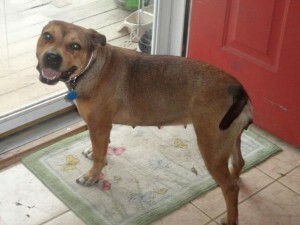 Hope is a 2 year old female Bull dog/ Pit Mix, is a small to medium dog approx.38 lbs. Hope is good with adults and children, is house broken,up to date on shots,spayed,gets along with cats and other dogs and know basic comamands. Hope was abandoned along side of the road when she was rescued by caring young woman. Hope would love a family of her own,other dogs and cats to play with would be great. Hope is the best! We are her foster parents and she is one of the best dogs we have ever had. He is well mannered, playful, very caring, and not a mean bone in her body. This picture does not do her justice…..she is much cuter.